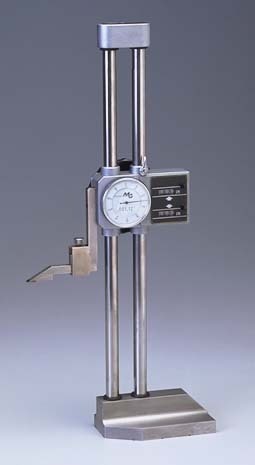 Twin column height gage with rigid, chrome plated beams. Digital counter can be zeroed out at any height. Digital counter has 2 displays which separately provide upward and downward movements. Base bottom is hardened and ground. Large feed wheel enables coarse and fine vertical movements. Available in 12”, 18” and 24” heights.